For all its tongue-twisting possibilities, the name Languedoc-Roussillon rolls off the lips easily enough for most British wine lovers. With the influence of flying winemakers and modern vinification, the quality and value of the region’s wines is now well-known – for both traditional AOCs featuring southern blends of Grenache, Mourvèdre and Syrah, and the Vins de Pays using international varieties like Chardonnay, Cabernet Sauvignon and Merlot. (Right: vineyards of Château de L’Ou). Yet the most southerly part of the Languedoc-Roussillon region, the vast territory of Roussillon that stretches from north of Perpignan, down to the Spanish border, and penetrates deep into the Catalan countryside of the French Pyrenees, has largelyescaped the attention given to the trendy communes further north. Roussillon – fiercely Catalan, and independent of spirit – has been faced with a wine marketplace that is changing faster and more radically over the past few decades than in the century that had gone before. Every wine-making area in the world has faces the problem of global over-production, with wines from Europe, Australia, Chile, South Africa and the rest flooding the market to such an extent that wine is in surplus and cellar door prices are squeezed into submission. Consumption of wine amongst the young has given way to euro-lager, lychee-flavoured vodka, and any number of more “trendy” drinks than the wine of the countryside. But a particular trial has faced the wines that were once the pride of the Roussillon – Banyuls, Maury and Rivesaltes. These are fortified, sweet wines made in a painstaking tradition that stretched back for centuries. Though as good as anything that Porto or Jerez had to offer, sales have been haemorrhaging. They are faced with modern wine tastes that have moved away from this style, and a new found Puritanism, enforced by the French government, that suggests abuse of alcohol, drink-related road deaths and the collapse of French society can somehow all be laid at the door of wine. The situation then, is not easy. Banyuls and Maury must find some way of stopping the downward spiral in sales of their glorious wines, whilst the table wines of the region need to scale new heights of quality. There has been quality, in the shape of generally inexpensive AOC Côtes du Roussillon, but the historcal bulk of table wine production was “En Vrac”: cheap wine dispensed by co-ops from petrol pump-style stations into five litre plastic containers. Rusticreds from over-cropped grapes, with fierce tannins and a rough charm where once the staple of Roussillon’s table wines, with very few of the many large co-ops aspiring to much more. Times change however, and the vignerons of Roussillon have had to grasp the nettle of improving quality and finding new markets for premium bottled wines. The past decade or so has seen sweeping changes in the region, and a re-engineering of the Roussillon: a move from Vins Doux Naturels to table wines, a move from co-ops to single estates, and a concentration on Roussillon’s terroir. The biggest challenge will be how to manage this without endangering that legacy of wonderful indigenous vines and unique wine styles. Land under vine in Roussillon today is just half of the 70,000 hectares of the 1960s. The AOC of Côtes du Roussillon remains the bedrock of quality dry wine production. 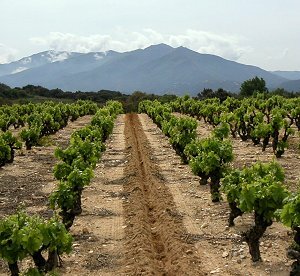 Covering 5,600 hectares of the Pyrénées-Orientales, Côtes du Roussillon consists of around 80% red wines, 13% rosé and 7% white. 32 towns are entitled to the more selective Appellation Côtes du Roussillon-Villages, where a further 2,100 hectares of vines are planted on steeper slopes giving lower yields. Only red wines qualify for the Villages status. Collioure is a relatively new appellation for dry whites, reds and rosés that covers the same geographical area as AOC Banyuls for fortified wines, the final part of its AOC status being granted only in 2003. Another notable sign of innovation and quality in the region is the creation of the first Côtes du Roussillon ‘Cru’, called Les Aspres. Côtes du Roussillon Les Aspres was recognised in 2003, only for red wines, because of the unique terroir around the villages of Aspres and Albères. There are also several Vins de Pays areas defined within Roussillon, from the catch-all Vin de Pays d’OC, which covers all of the Midi, down to tight localised zones like Vin de Pays des Coteaux des Fenouillèdes, where some truly exciting wines are being produced from both indigenous and more international varieties. 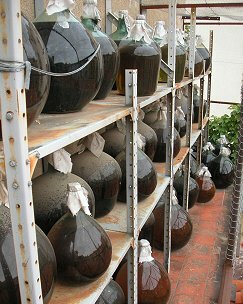 The fortified sweet wines of Roussillon are world famous: AOCs Banyuls, Maury and Rivesaltes produce “Vin Doux Naturels”: wines that have been made by a technique called “mutage”, in which grape-based alcohol is added during fermentation. Around 5 – 10% of spirit is added to the must, which raises the alcohol, stops fermentation, and allows the wine to retain sweetness from grape sugars. Most Vins Doux Naturels are then aged under oxidative conditions in oak casks, barrels or demi-johns left in the open air (right: demi-johns of Banyuls ageing at Domaine Piétri-Géraud). Some Vins Doux Naturels are not deliberately oxidised, including white Muscat de Rivesaltes, probably the most famous example of the non-oxidised style. For all the appellations of Roussillon, improving quality is paramount in the fight to maintain and improve their position in the world’s changing markets. That means tending vineyards with more care than ever before, and revolutionising tired cellars. But it also means infusing the local wine industry with energy and enthusiasm, to celebrate what is unique about these terroirs and wines, and getting that message across to modern consumers. I visited Roussillon in early summer 2005 to judge the Saint-Bacchus, a competition where each year an international jury awards a trophy to the best wine of each of Roussillon’s Appellations. I visited a dozen estates, and saw signs of change and an acute awareness of the task that faces Roussillon everywhere I went: re-vitalised Co-ops that have made huge investments in cellars and vineyards and are reaping the rewards with high cellar door prices and 90-odd Parker points, Biodynamic producers intent on pushing the boundaries of styles and grape varieties, and family estates run by a younger generation of savvy and switched-on winemakers who have a clear vision of the path ahead. I also tasted some ravishing sweet wines from Banyuls, Maury and Rivesaltes, offering endless complexity at bargain-basement prices. But this raised many questions too, with some producers close to despair that the struggle to sell these most traditional wines of Roussillon had almost defeated them. Some producers have already abandoned the style to peruse new markets for dry wines, and there is a real danger that some superb producers will join them, losing some of the world’s best and most distinctive wines. One shining example of the improvements that are being made in Roussillon is the Abbé Rous co-operative. State of the art cellars and obvious investment in vineyards is paying off handsomely, including an attention grabbing score of 95 from Robert Parker for their new age Banyuls, called ‘Hélyos’, made in conjunction with Dr Alain Raynaud of Bordeaux. I was received by Export Director Vladmir Algin, who took me high into the hills above Banyuls, who’s rocky, shale-littered slopes support ancient bush vines of Grenache that defy the seemingly barren and waterless conditions. Many are planted on terraces, and yields are strictly controlled through natural conditions of old vines and lack of water, but also through careful vineyard management. A 50/50 blend of Grenache and Syrah, this rosé won the 2005 ‘Bacchus’, in a category, which I judged. It has a vivid, pale pink colour with a nice crimson core. A delicate nose of flowers and herbs precedes good red fruits, with a rose-hip brightness and harmonious, fruity palate with a hint of spice and considerable staying power. 100% Grenache, this 95 Parker-point Banyuls is made from a rigorous selection of low-yielding old vines. It spent a year in new and used French oak. It has a deep, dense, crimson colour, with a dark, smoky aroma of cassis and blueberry, with some violet and a touch of dank, earthy complexity. The palate is intense, filled with luscious liquid cherries and spices: a real fruit essence, with a mocha coffee darkness and sense of brooding muscularity and depth. It has fine tannins and acidity, lovely harmony and great length. 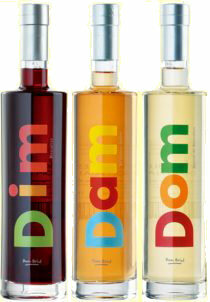 The second large co-op cellar that I visited is the dynamic Cave Baixas, who’s inventive marketing extends to a fun rosé wine called ‘Rosie’, packed in a bikini-clad bottle, and ‘Dim’, ‘Dam’ and ‘Dom’, three Vins Doux Naturel in striking modern packaging. Baixas’ more ‘serious’ labels are the Côtes du Roussillon-Villages Dom Brial and Château Les Pins (the Château itself is now a council building, with the co-op responsible for the vineyards). The 380 member growers are encouraged to concentrate on quality through a system of fines and bonuses, and co-op profits are ploughed back into the impressive facilities, with stainless steel tanks and a large underground barrel cellar, as well as a recently-built visitors centre and shop. Made from 15 year-old Grenache, Syrah and Mourvèdre by carbonic maceration, this has a deep crimson/black colour, and a nose of bright cherry and raspberry fruit, with a little schisty note. The palate has rounded, soft, easy-drinking fruit and plenty of juicy acidity. 50% Syrah, 40% Mourvèdre and 10% Grenache vinified traditionally and aged in oak. Deep, vibrant crimson colour and a lovely nose filled with glossy blackberry and damson fruit with a touch of dark chocolate and a creamy depth of background oak. On the palate it is juicy and savoury, with a slightly raisined fruit quality, and lots of dark, earthy berry underpinning. Fine quality here and good balancing tannins and acidity. Bruno Ribière met me in one of several small vineyards belonging to the estate, all totally biodynamic, and spread across a huge geographical area that makes harvesting a trial. M. Ribière is completely in tune with biodynamism: everything is governed by phases of the moon. He won’t have stainless steel in the cellar because it is a conductor of electricity and will disrupt moon cycles, so uses polyester tanks instead that “allow the wine to move and circulate in rhythm with cycles of the moon”. Extreme yes, but Ferrer-Ribière is making some stunning wines with all sorts of original thinking. A single vineyard Grenache is produced from 128-year-old vines, and late-harvest Maccabeu and other unusual wines are made in tiny quantities. The name of the wine refers to the fact that Ferrer-Ribière wanted to describe this 100% Macabeo wine as a Spätlese on the label, but were forbidden. It is made from late-harvested grapes, and has a fascinating nose of melon and smoky spices, with straw-like, herbal qualities. On the palate there is very dry pear fruit with a totally dry apple acidity and more of that herbal quality. Very distinctive. What a joy to taste this 16-year old white (2001 currently in Yapp Bros). It has a wonderful nose of preserved lemon, with salty notes, tangerine and lime leaves. The singular palate has hugely complex flavours that reminded me of Moroccan cooking (lime leaves, preserved lemon, spices) and soaring acidity. From a parcel of 128 year-old Carignan vines, and made by carbonic maceration, it has an intensely fruity nose of blackcurrant pastilles, Victory V lozenges and peppery spice. Fabulous, very fruity and full palate, with sweet and rounded red fruits, a touch of cough syrup and coffee, and a richness into the finish with good tannin and acid structure. Made from 50% Syrah and 25% each of Grenache and Carignan with traditional fermentation, this is aged in large oak vats for 12 months. It has a huge, thick, meaty nose with rich berry fruit, and a gamy complexity with brown sugar and spiced fruit compote. The palate has a creamy texture and terrific concentration, with a little bloody edge to fantastically deep-set fruit broadening with coffee and plum depth. The average yields here for the 65 year-old Grenache, Syrah and Mourvèdre (40%/40%/20%) are only 18hl/ha. Up to two months maceration is followed by ageing in a combination of new and old barriques and large oak vats. It is gorgeously deep on the nose, with damson jam and sweet caramel aromas. The palate has lovely richness and depth, with baked plum-pie fruit, a massive grip of ripe, creamy tannins and a solid, svelte fruit roundness. Philippe Bourrier has owned this 38 hectares of south-facing vineyards since 1998, farmed on strictly biological principals, with minimal use of herbicides and pesticides. The name of the estate comes from the Catalan word l’Ou, meaning egg, because of the egg-shaped well on the property. The Bourrier’s make a variety of Côtes du Roussillon and Vin de Pays des Côtes Catalanes wines from vineyards of eroded schist strewn with large stones. 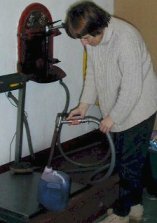 They have recently introduced a sorting table for extra quality, and their small, functional winery is entirely gravity-fed with no pumping of grapes or must. Philippe says his main task now is to identify parcels of vines to vinify separately in a continuing attempt to refine their portfolio. 80 year-old Grenache Blanc is harvested at only 18hl/ha, along with 20% of 36 year-old Macabeo. It has a delicate melon and softly herbal nose, with a very fresh palate showing a creaminess. The Grenache was barrel-fermented, giving a gentle orange and spice character, with a beautiful zip of grapefruity acidity into the finish. More or less equal parts of Syrah, Grenache and Carignan from old vines are vinified separately – the Carignan by carbonic maceration. There is a lot of depth here, with a soft, animal and smoky quality over solid, very ripe black fruit. On the palate it is blackcurranty and bold, with black cherry and light, but nicely proportioned tannins and a juicy plum skin acidity keeping it fresh. 45% Syrah is joined by 35% old-vine Grenache and 20% old-vine Carignan (carbonic maceration) followed by a year in barriques. It has lovely deep-set black fruit, laden with cedary spices and a glossy black plum and cherry fruitiness, suffused with an earthier note. The palate has good fruit, that is broad and perhaps a touch baked, but the tannins are polished and the finish sweet and pure. The 2002 also tasted is perhaps a little lighter, with a redcurrant fruitiness, but has beautiful harmony. The ebullient Laetitia Piétri squeezes past her brother’s huge motor-bike (parked in the cellar to escape the crowded streets of Collioure), where it seems to take up half of this incredibly small and cramped space. Just around the corner are the ageing cellars, but this must be a nominee for one of the world’s smallest wineries. The 2003 harvest commenced on August 23rd, which was the nightmare scenario for this town-centre winery, the narrow, hilly streets thronged with tourists. Laetitia is the fifth generation of her family to tend their 30 hectares of Collioure, alongside her still active mother, Maguy. Their vineyards are on steep terraces, where slaty soils support very old Grenache and Carignan, with more recent plantings of Syrah and Mourvèdre. Grenache Blanc with around 15% Vermentino is used for this barrique-fermented and aged Collioure white. There is a nice sweetness of vanilla, with delicate aromas of banana and yeast with some minerality. On the palate the oak and lees-stirring has given a rounded, chewy texture, but flavours are crisp and quite delicate with that mineral acidity asserting itself in the finish. A blend of Grenache, Syrah and Mourvèdre this is a special selection bottled separately from the regular Collioure, made from super-ripe grapes ‘scorched’ by the ferocious heat of summer 2003. It has a very sweet cassis nose, with a fine, fudge and chocolate character. The palate has maintained a really racy acidity, with clean, crisp cherry skin acidity cutting through the creamy, plum and blackcurrant fruit, with a dark hint of espresso-like oaky depth. Very powerful, but retains elegance. Grenache with 10% Carignan, this is aged in large oak vats, with 10% aged in barriques in the open air. Basically this is a solera, with some wine always deliberately left behind. It has a browning colour and nicely oxidised nose of sherried, slightly raisiny fruit, prunes and mocha coffee. The palate is lush and creamy, with a beautiful sweetness of Muscovado sugar, rich wild berry compote and delicate nuances of tea and tobacco. The pure, long finish fills in with a bittersweet dark chocolate and a nice edge of tannins and acidity. The wine made in demi-johns stored on the cellar’s balcony, composed of 80% Grenache blanc and 20% Grenache gris, and of course heavily oxidised to a nut-brown colour. Beautiful nose of caramel, orange and walnut, with honey beginning to emerge. Very, very smooth honey and toffee palate, with some Christmas cake-like flavours, candied fruit and marmalade. Very smooth and warming into the finish, where a nice bite of tannins and suggestion of mineral acidity give it structure. Marie-Pierre Piquemal and her brother Franck, who is winemaker, greeted me at their cellars in L’espra de l’Agly, not far from their 65 hectares of vineyards in the foothills of the Corbières Mountains. The family has run the estate for 100 years, and it is very much a family affair with various dogs and children to negotiate on the way to the small tasting room. Their vineyards along the banks of the Agly are a complex mix of schist, marl, granite and limestone. I was amazed to see the colour of the earth change from white, to rich red, to carbon black within a few hundred metres. This very professional cellar produces very modern Vins de Pays, elegant and traditional Côtes du Roussillon and a selection of Rivesaltes Vins Doux Naturels. This wine is composed of 50/50 Maccabeu and Grenache blanc, aged for six months in barriques with lees stirring, but no malolactic fermentation to retain freshness and acidity. It has a heady 14% alcohol. It has a big, grilled, toasty nose with rich peach and apricot kernel fruit, leading on to a surprisingly refined palate, of incisive, savoury pear and white peach, with a dry, crisp finish. This inexpensive VdP is composed of thirds of Syrah, Cabernet Sauvignon and Grenache, vinified in steel. It is bold and powerful, with slightly baked but deep plum and cherry fruit. On the palate there is a bite of roughening plum skins in a rustic, bold style with earthy grip and a clean, savoury finish. The Mourvèdre (40% plus 30% Syrah and 15% each of Grenache and old-vines Carignan) comes through strongly on the nose, with a meaty, dark, gamy quality and plenty of solid red fruits as well as a dense layer of spices and cedar. The palate is also meaty and powerful, with lots of tangy, bold cherry fruit and a nicely balanced finish. a special selection of late-harvest grapes, which is made only three or four times per decade. It spends 24 months in barrique, and has 16% alcohol. It is a deep, buttercup yellow colour, with a rich marmalade nose, with butter and fine dried apricot fruit. It has a full, rich texture, with a toasty breadth and a terrific opulence and roundness of fruit. Limpid, fine acidity gives an elegant crispness to the long finish. Pascal Rossignol is very much a hands-on winemaker, including building his own underground barrel cellar by hand. Pascal farms just 21 hectares, growing nine indigenous varieties, with no ‘international’ grapes. He is currently replacing some of these with more Syrah, as he believes his gravelly terraces at 150 metres above sea level are well suited to this variety. His Muscat ‘Sec’ is also extremely popular with visitors to the small tasting room and shop. Some of Pascal’s wines qualify for the new Roussillon Cru, being within the hills of Les Aspres, with the 2004 (in barrel at the time of my visit) being the first vintage. Lovely aromatics here, of peaches and fresh grapes, with a hint of pineapple. The palate is flooded with broad, juicy fruit, that is very unctuous for a Muscat, though a crisp grapefruit and lemon acidity rushes in with some nettle notes in to the finish. From a gravel terrace in Les Aspres, this is a hand selection of 46% Syrah, 37% Grenache and 17% Carignan, aged twelve months in Alliers oak barrels. There is very fine fruit here, with lovely aromatics: lots of schisty, charcoally notes, earth and minerals and plenty of deep-set blueberry fruit. Gorgeous fruit on the palate, with rich, silky tannins bolstering a long, sweet mouthful of black fruits. Lots of spice and creamy depth into a balanced finish. This was a barrel sample of a wine to be released in 2006. Very pure fruit on the nose, with herbal notes, a cedary, toasty quality, spice and savoury black fruit. It is very mineral on the palate, with a fine dry extract of blackberry and black cherry, though really good ripeness and sweet, focused fruit. 80% Grenache blanc and gris, with 20% Muscat, is hand-selected each vintage and spends two years in barriques. A burnished amber colour precedes a beautifully delicate nose with apricot kernel and raisins, some walnut but plenty of freshness of fruit. The palate has superb sweetness with luscious honey and a real richness of fruit melding into toffee and a finely balanced finish, with no alcoholic ‘heat’. The third co-op of my visit was the large Cave Terrats, who’s wines appear under the Terrassous brand. Founded in 1932, over 800 hectares are farmed by 80 members, growing traditional varieties. Chef du Cave Xavier Ponset met me and showed me around. With ample evidence of investment, including new stainless steel tanks to supplement the highly unusual fermentation ‘tower’ (shown right), Xavier explained that their 20 largest members control 90% of production, and as none of the growers is older than 45, there is a naturally progressive attitude. The co-op was busy with local buyers of both “en vrac” red, white and rosé (all of good everyday quality) and cases of bottled wines. Terrasous has some incredible old Vins Doux slumbering in barrels up above the winery in the loft, like a magnificent 1983 Rancio Rivesaltes Ambré. My one sadness is that Xavier shrugged as he drew a sample of this nectar for me to taste: “who knows if it will ever be bottled?” he said, going on to explain how difficult it is to sell such wines in today’s market. The almost equally stunning 1974 is currently for sale at 30€ – a stand-out bargain for such a singular old wine. 45% each of Syrah and Mourvèdre, with 10% Grenache, aged 10 months in barrel. Quite a fresh nose, with a nutty quality and bramble fruit, a meaty note too and lots of fruit depth. Plenty of grippy structure in the mouth, with a liquorice edge to the fruit extraction and firm tannins. Lots of spices and peppery notes too into a savoury, crisply defined finish. From the Cru Les Aspres, same blend of grapes aged 10 months in barrels, 30% of which are new. It is a vibrant crimson, and though slightly reduced at first I thought, revealed meat-stock and animal aromas with a core of black fruit. On the palate a big, powerful, resonant wine with lots of cedar and earth, a warming coffee note and a rounded, full finish with excellent concentration. Oak and acidity are nicely weighted. 100% Grenache blanc, that spends three years in barrel. Unusually, the alcohol is added to this wine in barrel, not in tank. It has a full, buttery, softly floral nose with orange fruit. On the palate there is a really coffeeish depth to this, with lots of luscious honey and laden with gorgeous glacé pineapple fruit. Wonderful length and warming depth married to lingering sweetness. Gorgeous tawny colour. Lovely rancio nose, with notes of rotting oranges, coffee, walnuts and rum-soaked raisins. The palate has wonderful glowing sweetness, of plump sultanas and stewed figs, burnt toffee and marmalade, and that drying, warming, walnutty richness. It still has freshness with a keen edged acidity and superb length. I brought a bottle of this home. Soaring currant and Maraschino cherry nose, with essence of cassis and a hint of bitter cocoa. On the palate there is a flood of fine, sweet blackcurrant and a very concentrated, thick damson and black fruit compote mid-palate, with warming, notes of cocoa and fudge. Very dense and full, this has a nice tannin and acid balance, and is very modern in style, with no hint of oxidisation. Aged for one year in glass demi-johns, then 19 more years in large oak vats before release. It has a stunning nose that is sweet and aromatic, with herbs, tobacco, spices and camphor, lots of sweet chocolaty vanilla and a red plum fruitiness. On the palate a beautiful sweetness of ripe, deep, chocolate and rich autumnal berry fruit, with brown sugar and cherry notes and a deep, glossy character. It has an endless finish, with more delicacy of tea and tobacco, and a warming coffee core. A very interesting nose here, with all sorts of vegetal and leathery notes alongside red fruits. The palate has a huge intensity of raspberry coulis sweetness matched to a pure, glistening acidity. Real chocolate and fudge-like richness starts to emerge, and this melds into a chocolate/strawberry softness with superb length. Very focused, very long and seamless. See all Banyuls stockists on wine-searcher.